Brazil's President Dilma Rousseff speaks during a meeting at the Planalto Presidential Palace, in Brasilia, Brazil, April 13, 2016. Brazil is in political turmoil awaiting reaction from President Dilma Rousseff on the launch of impeachment proceedings against her less than four months before the Olympic Games open in Rio de Janeiro. The Senate could vote in early May to proceed with impeachment against the 68-year-old leftist leader, and if it does, she would be forced to step down for up to 180 days while an impeachment trial is conducted. Only a simple Senate majority is needed to proceed with a trial and Brazil media reports say 45 of the 81 senators favor a trial. Vice President Michel Temer, once Rousseff's ally but now accused by her of being a traitor, would assume the presidency if Rousseff is suspended. But he has been implicated in Brazil's mammoth corruption scheme centered on the state-run Petrobas oil company and he also signed off on some of the government's same budgetary maneuvers at the heart of the impeachment case against Rousseff. In six hours of raucous voting Sunday, Brazil's lower house of Congress, the Chamber of Deputies, voted overwhelmingly, by a 367-137 margin, to start the impeachment process. Fireworks lit up the night sky in Sao Paulo and Rio following the vote. Hundreds of thousands of demonstrators, many calling for Rousseff's ouster and others supporting her, took to the streets in cities and towns across the country in peaceful protests. "Impeachment!" shouted the front page headline Monday in the Folha de Sao Paulo newspaper. "Close to the end," another leading paper, O Globo, said, adding, "Dilma Rousseff yesterday started to say goodbye to the presidency of Brazil." Rousseff is vowing a "long" fight against possible impeachment. During a televised news conference she said that she is "outraged." "I have strength, spirit, and courage. I will not be beaten. I will not be paralyzed...This is not the beginning of the end. The battle has begun. This fight will be very long and memorable," she said. Rousseff had especially harsh words for Vice President Michel Temer - her former political ally who is a leader of the pro-impeachment forces and would take over if she is impeached. She called Temer a traitor. 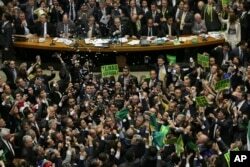 Opposition lawmakers celebrate after the lower house of Congress voted to impeach Brazil's President Dilma Rousseff in the Chamber of Deputies in Brasilia, Brazil, April 17, 2016. The International Olympic Committee said the impeachment process against Rousseff should not halt work leading up to the summer games, set to open August 5. It said preparations "have now entered into a very operational phase where these kinds of political issues have much less influence than at other stages of organizing the Olympic Games." Political surveys show Rousseff's popularity has dipped into single digits amid charges that she engaged in budgetary sleight of hand in 2014 before her re-election to mask the country's sharply declining economic fortunes, tactics her supporters point out have also been employed by other Brazilian leaders in the past. Not long ago, Brazil was viewed as an emerging global economic powerhouse, but now is in the midst of its worst economic downturn since the 1930s, which many of Rousseff's critics blame on her. Opinion polls show 60 percent of Brazilians support her impeachment. Rousseff has not been accused of corruption, but her government has been tainted by the graft scandal at Petrobas. 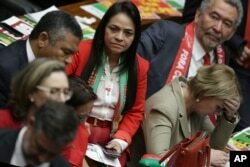 Congresso em Foco, a prominent watchdog group in Brazil, said that more than 300 of the lawmakers who voted against Rousseff are under investigation for corruption, fraud or electoral offenses. Chamber of Deputies Speaker Eduardo Cunha, second in line to the presidency, has been charged with taking $5 million in bribes in the Petrobas scheme. Ruling party lawmakers react after the lower house of Congress voted to impeach Brazil's President Dilma Rousseff in the Chamber of Deputies in Brasilia, Brazil, April 17, 2016. Latin American analyst Sean Burges of the Australian National University told VOA that the Brazilian governments of Luiz Inacio Lula da Silva and Rousseff, his handpicked successor, have engaged in "pretty incredible acts of corruption, but no worse than any other party that's been in charge in Brazil." He said that "in terms of legitimacy, whoever is in charge in Brazil is going to have a horrendous time." The move to impeach Rousseff is the second time in less than a quarter century Brazil has opened impeachment proceedings against a leader. In 1992, then-president Fernando Collor de Mello resigned after he was impeached and before the Senate took up his case of alleged influence-peddling. In the lower house Sunday, the chamber's 513 deputies rose to announce their impeachment vote at a microphone, greeted by cheers and sometimes jeers from the rest of the members. It took them five hours to reach the needed two-thirds majority, or 342 votes, to initiate the process. Rousseff's opposition cheered wildly when support reached the 342 vote threshold. Jose Eduardo Cardozo, Rousseff's attorney general, described the vote as "a coup against democracy." Ruling Workers' Party leader in the House, Jose Guimaraes said, "The coup plotters have won." He called it a "temporary defeat" and said it does not mean the war is over. "The fight will continue in the streets and in the Senate," he said. Rousseff was first elected in 2010, with the leftist Workers' Party now in control for the past 13 years.